While we’re on the topic of playtime with pooches, I gotta share with you this great, new toy I found! For all sizes and activity levels of dogs, as well as all ages of humans in your pack, your pup can now play tug to his heart’s desire without tiring you out. 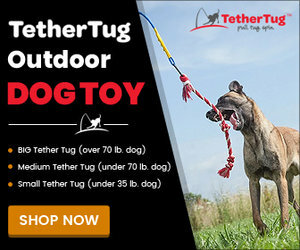 Tether Tug entices your dog to tug away on his own, which helps him avoid boredom. We all know how destructive a bored pup can be! You can tug with him, or your dog can tug away while you have fun interacting with him, or just sit back and watch him have all the fun! Dogs naturally are driven to grab hold of things that move and pull upon any resistance. This is an extension of their innate prey drive. Some dogs have a stronger drive than others. For example, Hanani naturally has a higher drive than Mia. It’s in her blood, so to speak. She is a Dutch Shepherd, bred for herding primarily, but tracking and protection as well. This pup is constantly on alert for something moving! Although her drive can be aggravating to some, it is essential for various types of work. Types of work, such as the cadaver search work Hanani is training for, requires a dog with a higher drive. That doesn’t mean that other dogs have no drive or are not good for such work. This does simply mean that some breeds are literally born for some forms of work. Mia loves to play tug, too! However, she just has no interest in the training required to be a working dog 🙂 For her, using tug play as a reward in other areas, or even just play time, is a great tool. Playing tug is also a fabulous exercise for pups of all ages. It is the only “play” in which their entire body gets a full workout. Their mouth, of course, along with neck, shoulders, legs, back, cardio…as well as mental activity and stimulation, on top of the energy exerted. The entire dog! Just have a look at this dog tugging away! While looking around, researching this great product, I came across quite a few articles that really rubbed me wrong. Now, there are all sorts “out there” with mountains of misinformation. I get that. Be informed, verify your sources and all. Immunize yourself from viruses of quackery. Still, some of the junk that gets out there just irritates me beyond my ability to ignore. Can you believe that there are many sources out there–at least a couple that are considered bonafide (such as WebMD)–that actually try to convince folks playing tug with your dog encourages them to be aggressive?? HOW in the world can you make a dog aggressive by playing a cooperative game that works out LOTS of energy in a positive way and builds trust and a bond like no other form of play can?? IDIOTS! Take Mia and Hanani, for instance. Hanani, a terrified, possessive, high drive pup that took many weeks to settle. Mia, a soft but driven, older gal. That moment I spoke of earlier, when Hanani initiated a tug play with Mia? She was essentially saying, “Hey, I want to trust you. Let’s work this out.” Of course, I am always right there with them so things do not get out of hand. But where Hanani is now? Oh gosh! She went belly up to Mia not long ago! That is trust! And what say those that purport such nonsense… What say you to the fact that tug is used as rewards when training and working all sorts of specialty trained dogs? Cadaver dogs, SAR (Search & Rescue), narcotic sniffers, you name it. So, let this sink in. By God’s grace, I took in a high drive, terrified pup that was isolated (before I got her) and enticed constantly. A pup that would tear into anything that moved. A pup that used to be aggressive. I played tug with her. I encouraged Mia to play tug with her. Now she is a compatible member of our pack who does not tear up our house, is not aggressive to our members and listens like a champion. And, a vast majority of sound, well-trained working dogs are rewarded with tug play regularly. In the meantime, tug away with your pup and try out the Tether Tug!